UPDATE, Aug. 24: this work has been cancelled and will be rescheduled at a future date. 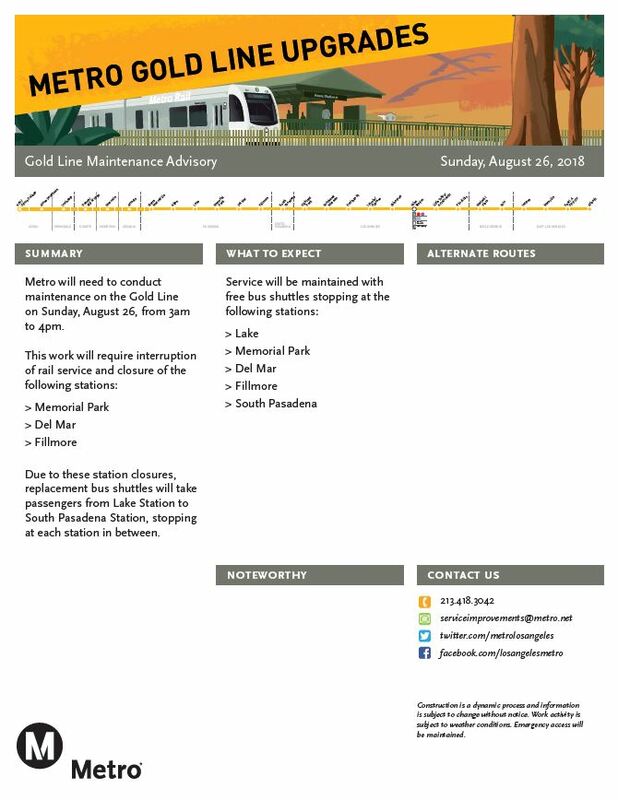 On Sunday, August 26 from open until 4 p.m. there will be no Gold Line train service to three stations: Memorial Park, Del Mar, and Fillmore. During the closure, crews will perform track maintenance and upgrade work. Free bus shuttles will replace trains between Lake and South Pasadena throughout the closure. This means all southbound trains will travel as far as Lake and turn back to Azusa. The last stop for all northbound trains will be South Pasadena. From there, trains return to East L.A. The Gold Line is scheduled to run every 12 minutes while work is in progress, and shuttles will match train service as best as possible. Please allow extra travel time to transfer between the train and bus shuttles. Metro personnel will be at the affected stations to lend assistance. Regular train service to all stations is slated to resume at 4 p.m. on Sunday. “track maintenance and upgrade work” is a bit on the vague side. Can you please be more specific? Being more specific helps people be more understanding. Lol they do vague track maintenance basically everyday except Friday midday. For a route that is less than 15 years old, this line sure needs a lot of TLC. Makes me suspicious if having had an independent construction authority was really a good idea. Not necessarily. It is just work that should be done at night is being done by announced shutting down of the line.